Jenny Tingle is back out interviewing some great acts, and her latest visit to our website does not disappoint! Check out the chat when Jenny met the excellent Midnight Force! 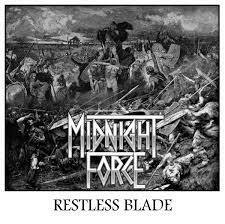 Midnight Force have returned from touring Germany and gone straight back into writing and recording for their debut album. How was the tour guys? I heard that during one of show, John (vocals) almost got electrocuted by a dodgy microphone! John: I mean, I wouldn’t have minded but I didn’t get superpowers out of it or anything. Just my luck. Ansgar: Yeah, it was quite adventurous! The show in Oldenburg was unfortunately marred by massive technical problems, and some very dodgy gear, like the microphone! Other than that it was good fun and the three shows were all very well received. Where is your favourite place to visit in Germany, and your favourite gig of the tour? John: Honestly, anywhere new is such a refreshing experience for us. Germany’s generally really fun to play and everyone there’s really into their metal so anywhere we go is a lot of fun. Generally I reckon Oberhausen’s been my favourite place so far, but as for the tour I’d need to say Uelsen. It was a nice, laid-back affair and it was good that some people we knew were there to get others into it too. Ansgar: I might be a bit biased, as it’s my hometown, but I also have to say Oberhausen. My favourite gig of this tour was Essen. A packed out small venue and great atmosphere. We only got to play a short set, but it was still brilliant. The new Midnight Force album is well underway. How soon can we hear it? John: We’re hoping to get it sorted by early 2018, or by Christmas if the capitalism buzz takes us. Ansgar: A release near the end of the year would be ideal. We are aiming to have everything done by then anyway, but how we release it, what formats, possibly via a label etc., we still have to see. Your EP, Restless Blade, draws on a lot of Medieval themes including battles and assassins. John: Indeed. And death, magick, things like that. For the new album, where did you get your inspiration for songwriting? John: Mostly just cool topics that pop into our heads. Dunsinane was written when Ansgar was procrastinating from uni work and he wrote Warlord Eternal when we’d all watched Highlander together. Brenden mostly writes about historical stuff he likes and books. For my own part, I’m in the midst of writing quite a long, possibly quite pretentious piece that should be ready by about 2021. Where did you get the sword and dagger for your shows? I bet you don't want to get stopped by police after a gig carrying those! John: The sword and the dagger are Pete’s. We work our way around it fairly well given that we almost never get searched by the cops anyway. Ansgar: Yeah, so far we didn’t have any problems, and John has not yet stabbed one of us during a show, so that’s good going! Which bands made you want to become musicians yourselves and why? John: In my own case it’s the really obvious ones like Iron Maiden, but every band I saw play inspired me in some way - even the high school bands that I saw as a young lad. Ansgar: Probably bands like AC/DC or the Rolling Stones. I saw both together, at my first ever gig as a child and it was an experience that made a lasting impression on me. I started playing keyboards first but then took up the guitar to start a band. Is playing European tour shows a very different atmosphere compared to gigs in the UK? Probably the beer is better at least! John: Oh it is. Though I’m not above a pint of Tennent’s here and there. As I say, anyway, German metal fans are some of the most up-for-it lot we’ve encountered. Here, people do seem to enjoy it but can be that little bit more reserved unless a few beers are concerned. Ansgar: Especially for old school Heavy Metal there is countries in Europe that simply have much bigger scenes than Britain, or Scotland in particular. Germany is definitely one of those countries, which is why we always got a very warm welcome there. We cannot wait to go back over at some point! Having said that, we have yet to have a bad gig in the UK as well, everywhere we played, be it Belfast or Manchester or Newcastle we had a blast! What advice would you give to bands from experiences you've had yourselves? John: Focus. Think about what you want to do, put your damndest into it and before you know where you are you’ll be getting places, seeing new towns and gigging with bands you really like - possibly even us. Of course, it helps to have at least one person in the band with a few contacts and their head screwed on the right way. Ansgar: What John said. And I’d say bands should always be bold. And take some risks. Like, go play somewhere outside your hometown, it might take some time, money and effort to be put in but go for it. Contact local promoters or bands and put a gig together, drive/bus/train it over there and reach new people. When's the next time we can see you live? Ansgar: We’re playing Heavy Metal Halloween in Sheffield at the end of October and the next Glasgow show will be on the 9th of November, together with Night Demon and Venomwolf at Nice n Sleazy’s. Playlist for the Party at end of the world- Things seem to be going downhill recently with a lot of world leaders making up for what they lack in intelligence with sheer aggression. As a band, which song would you choose if it was the last thing you could listen to? John: I can’t comment anything about intelligence, I’m afraid. Ansgar: ‘When the wild wind blows’ by Iron Maiden would come to mind. John: Medieval Steel. Or MC Hammer or something else. It would depend what was happening around us - got to choose songs for the atmosphere, y’know? Ansgar: I think we, as a band, can all agree on Medieval Steel. John: Keep it Steel, and buy seven copies of our album.